When we first visited New Plymouth in “The Naki” two years ago I was honestly amazed how many tourists volunteer each day to climb up Mount Taranaki. Back then, a little jealous but also somewhat hopeful I casually mentioned that “One day we’re going to do this too!”. Turns out this idea got stuck in my head and finally gained upper hand. 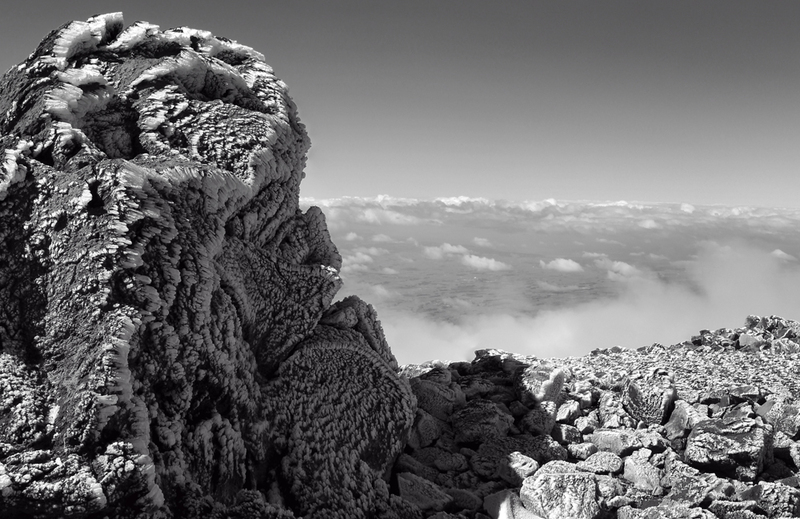 10 days ago we conquered the summit (yeah, it’s a bit of a spoiler alert, isn’t it?). 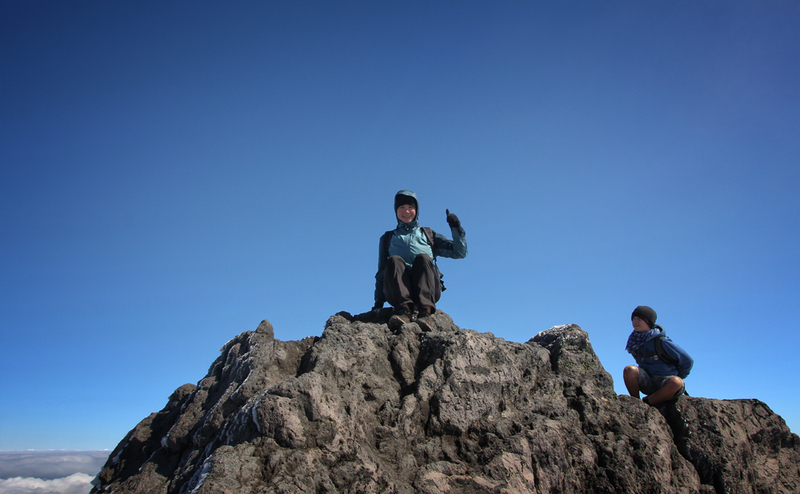 I have to admit that our plan to climb a dormant volcano got me a little excited. 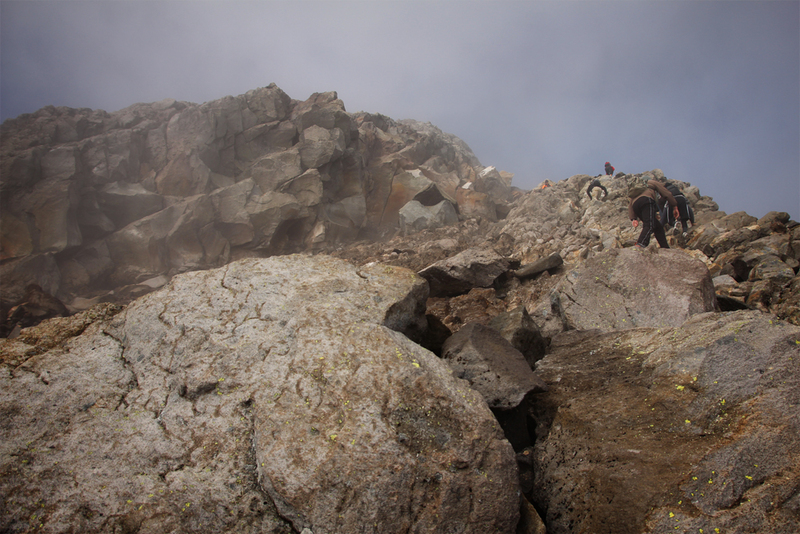 After all, we had to overcome 1,600 metres in altitude. That is when a few people I know start to be short of breath. No fingerpointing. Especially not towards me. To my surprise though we advanced relatively fast; definitely faster than expected. All in all we needed 8 hours for the 13 km round trip with an average gradient of 36 degrees. A nice day trip really! And my intensive running program had just proven its value. Mr ae.i joined me, and we left the parking lot at North Egmont visitor center (936 m) around 7am with lots of food and 2.5 litres of water apiece in our backpacks. Additionally, we decided to bring sweaters, hats, gloves, waterproof pants and jackets, a GPS watch, camera and flashlight (you never know). 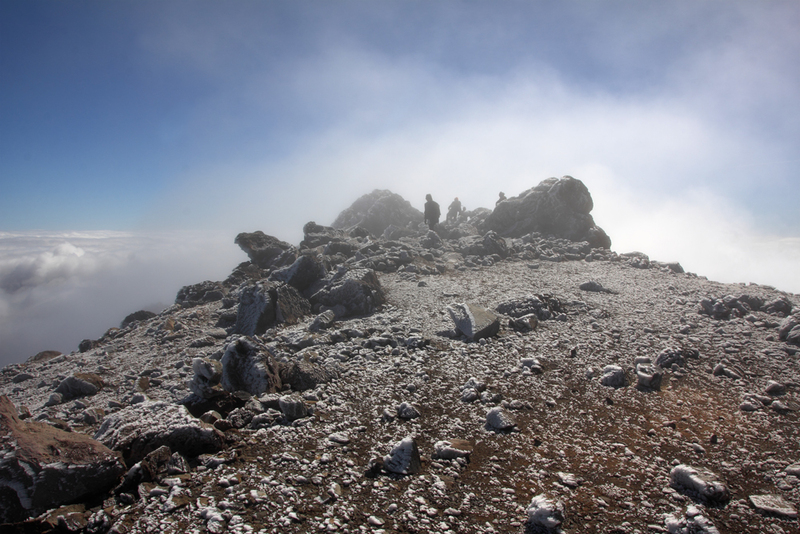 The weather forecast was good, though in “The Naki” that doesn’t mean much. The weather can change within moments in that region. 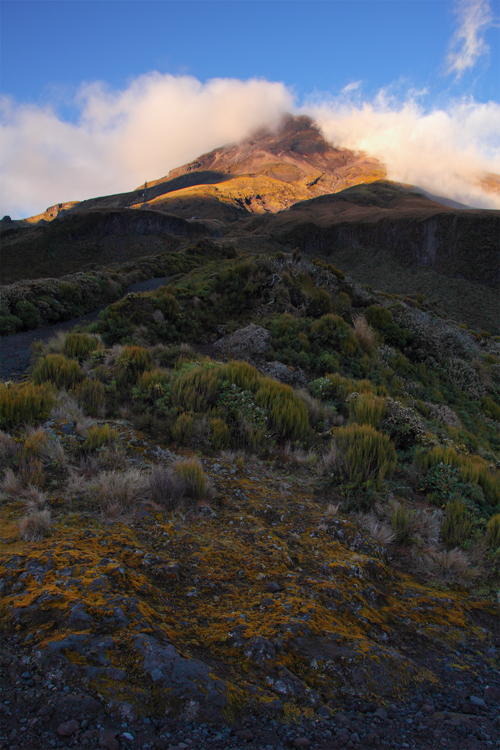 That morning, the top of the volcano was shrouded in a cloud, and more clouds seemed to be rolling in. The first part of the track is a rather winding gravel road which led us through the lush forest of the National Park. Slowly but surely we noticed how the trees around us started to make space for a few isolated bushes and grasses. 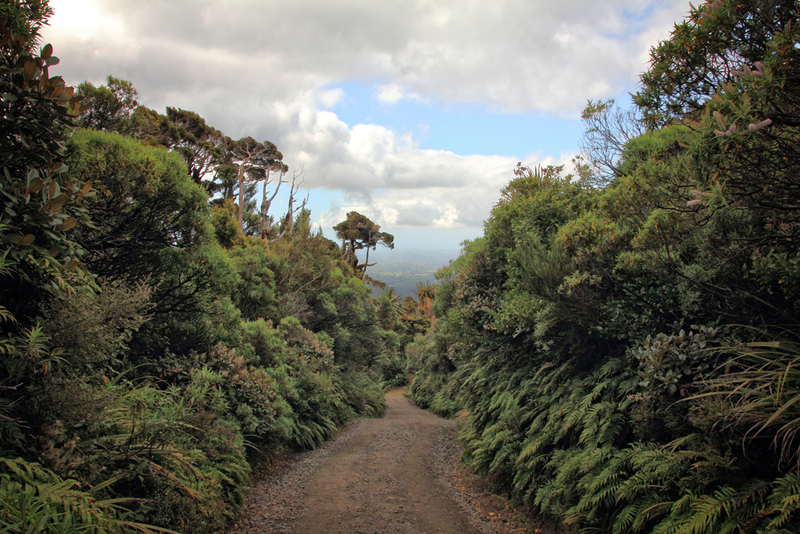 That’s when the gravel road merged with an unexpected concrete road (The Puffer), the steepest part just before our first milestone – the Tahurangi Lodge in 1,492 meters above sea level. Since we were still feeling fresh we decided to directly continue on the track behind the hut without taking a break. 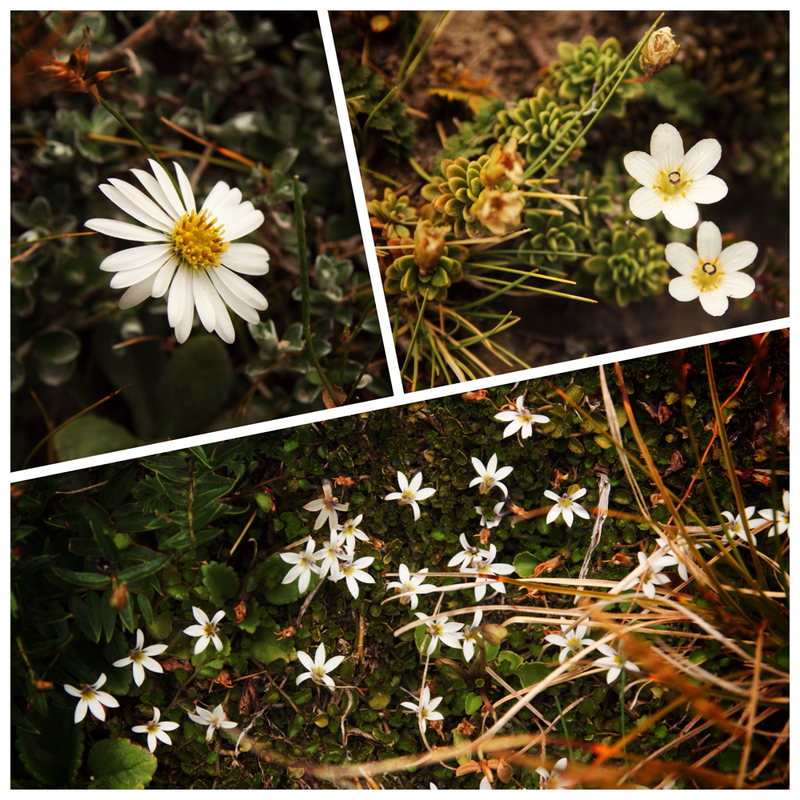 The site got clearly rockier, but well maintained steps let us quickly move forward on the terrain which appeared to be overgrown with moss and little white flowers. That’s how we covered two thirds of the way in only 2 hours. 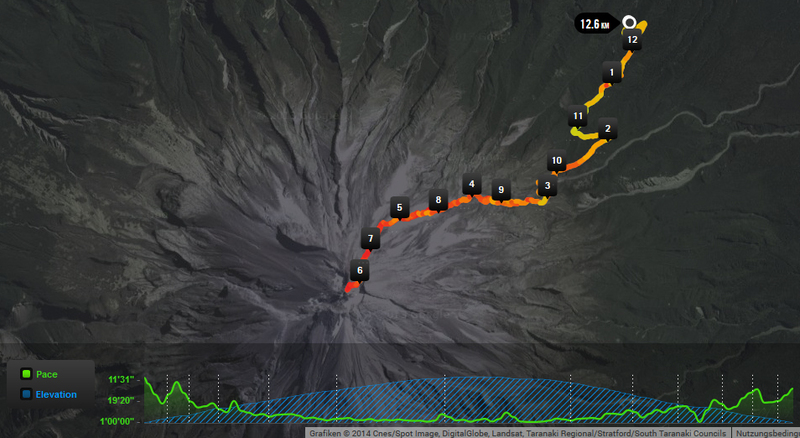 However, the last two kilometres to the summit are advanced level really. Nothing grows there anymore. 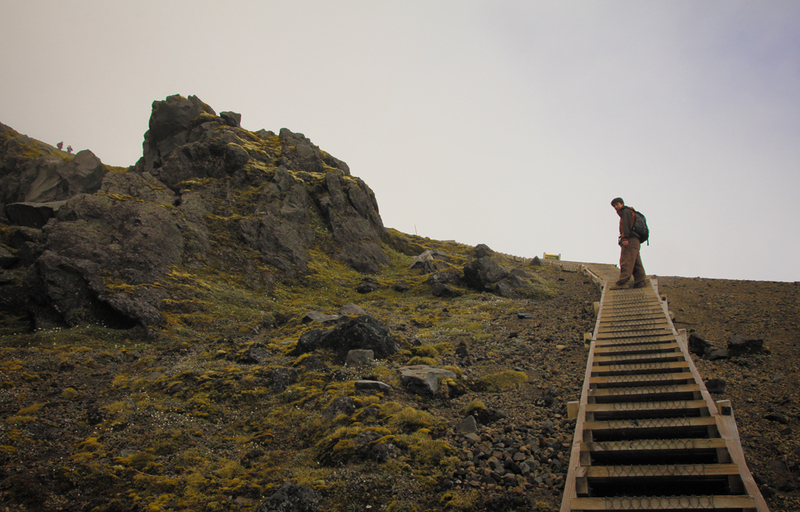 The stairs end in the steep scoria slopes, a gravel and scree terrain that rarely offers a flat surface to take a break. At this point I wished I would have had a walking stick with me. Not only would it have provided more stability during the ascent, it would have certainly been beneficial while pausing and taking a look around. Even though I usually don’t mind dizzy heights, that wish crossed my mind while I was standing on slippery pebbles staring a few hundred metres down the slope. 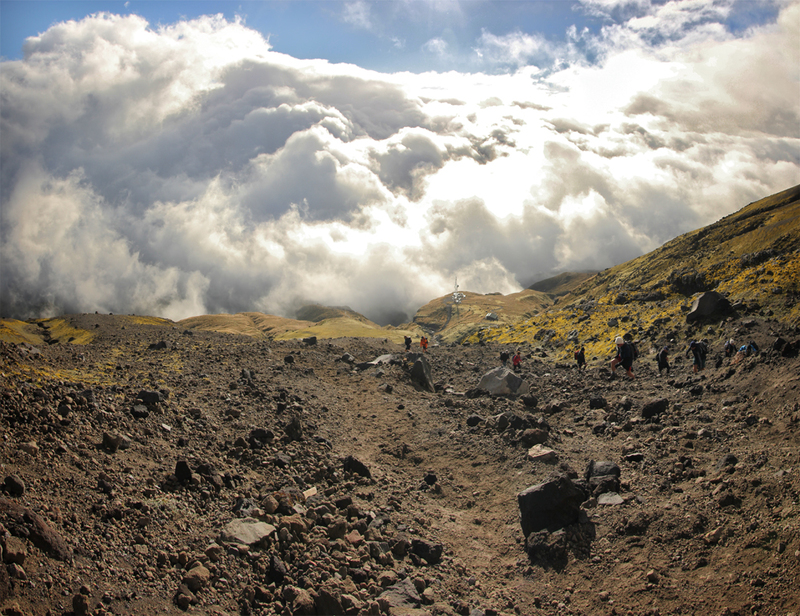 At our feet, or rather at the foot of the volcano, clouds had been rolling in during our ascent and blocked the view from the sun. Maybe you can imagine what a small first highlight it was for us when the sun made its way through the cloud layer and freed the view over the scoria slopes back towards the Tahurangi Lodge. 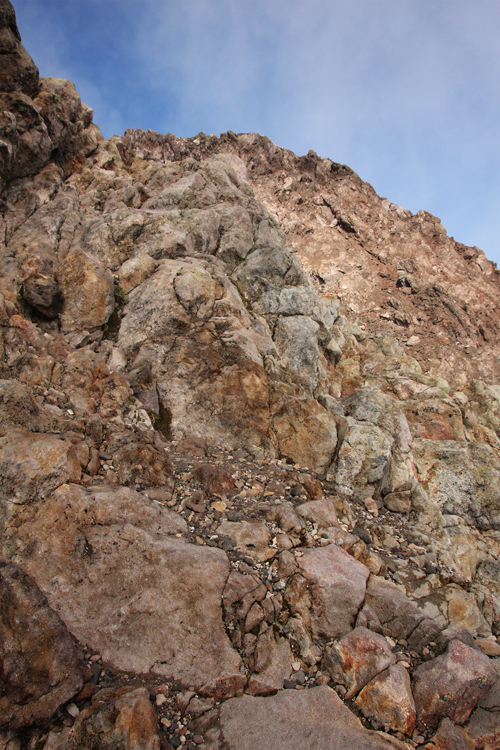 Once we left the scoria slope behind us, The Lizard was already awaiting us – a rocky ridge which I mostly explored on all fours, even if it was only for climbing. The steps seemed to be getting higher and higher after 3 hours of walking. While we spent most of our “Lizard quality time” surrounded by clouds the mountain summit actually appeared almost cloud-free. However, the temperatures now left a lot to be desired. At -10 degrees (°C) it was probably also no coincidence that we stumbled upon the first frozen rocks a few metres below the mountain peak. 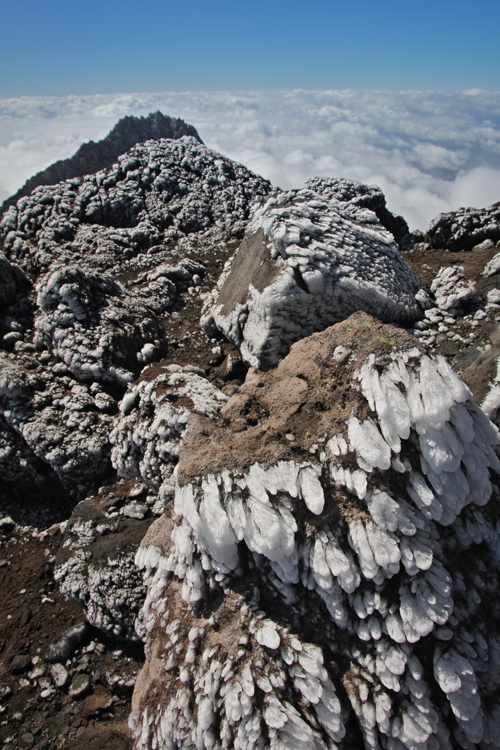 Even a thick layer of snow was left in the crater area. Time to unpack a few extra layers of clothes. After all we didn’t climb that far to turn around like a pair of fraidy cats. 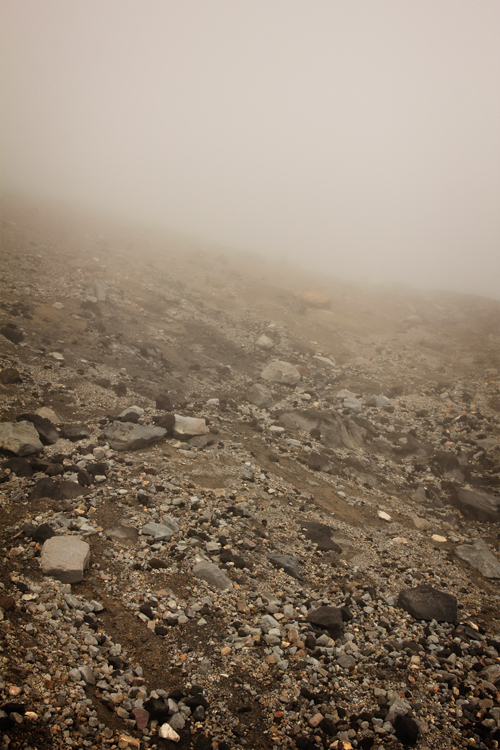 The final slope before the finish was covered by scree again – the two steps forward one step back style scree if you know what I mean. 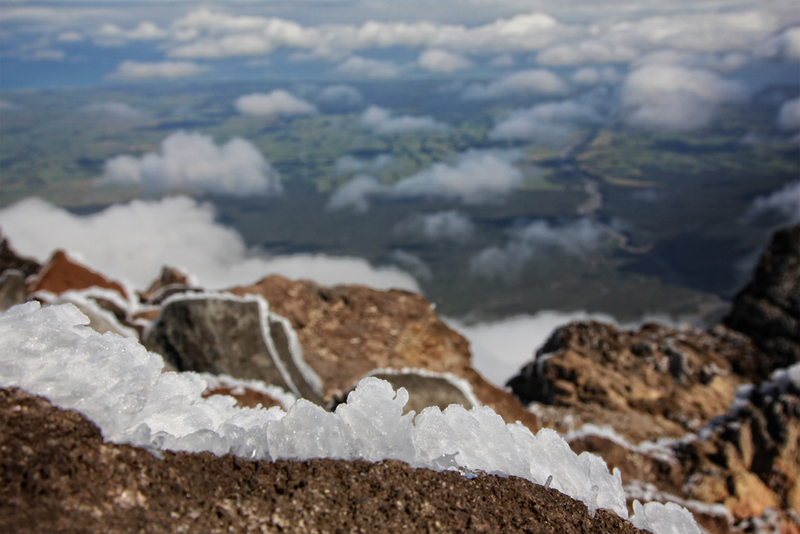 But the view over the volcanic crater and clouds landscape below us compensated for all of that. 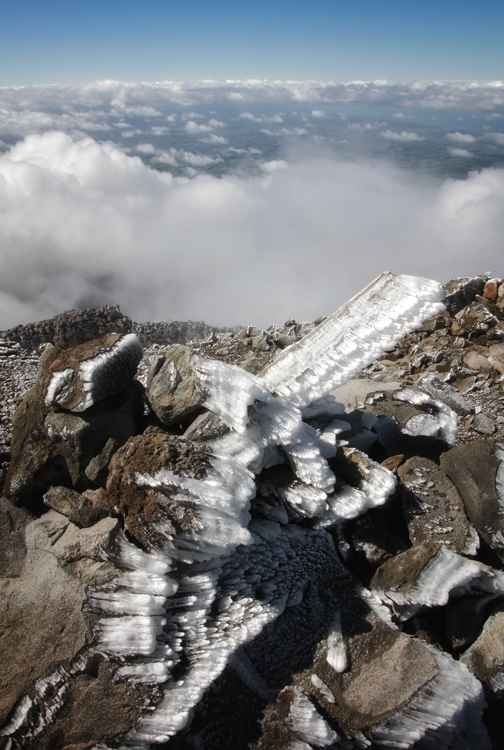 I was truly fascinated by the most beautiful icicle formations that seemed to surround every single rock in that area, and didn’t even shy away to conquer the poles marking the track. They clearly signaled that the wind up here blows often from the same direction. 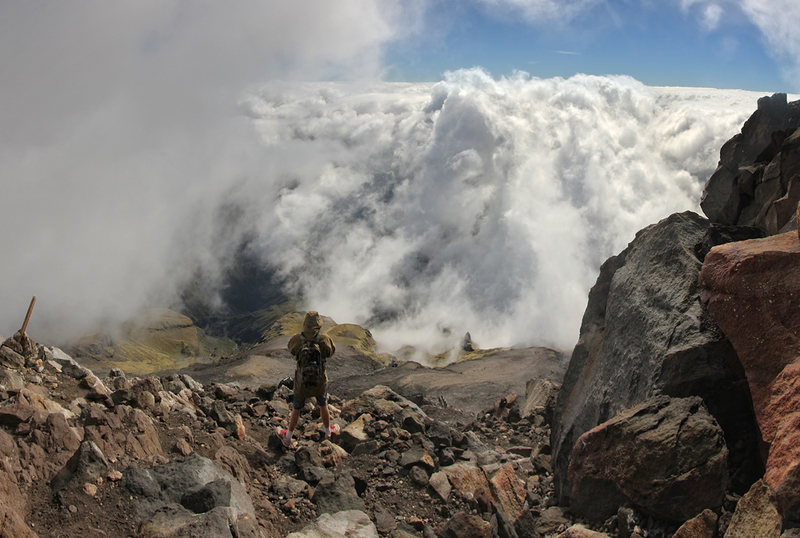 The minute we finished the first half of the way (6.5 km till the Taranaki Summit; 2,518 m) after 4 hours of climbing we knew that the view was worth every single metre – and also every single calorie burned. It is hard to believe how great a picnic in freezing temperatures can actually be. However, after a breather and the obligatory photo stops in all directions, the cold finally got to us. As much as we would have liked to stay longer we felt like we needed to keep moving and started the descent to warmer realms. Now it got really tough. Usually I rock when walking downhill: I’m not afraid of heights, I don’t fear to speed up, and I don’t suffer from knee problems. 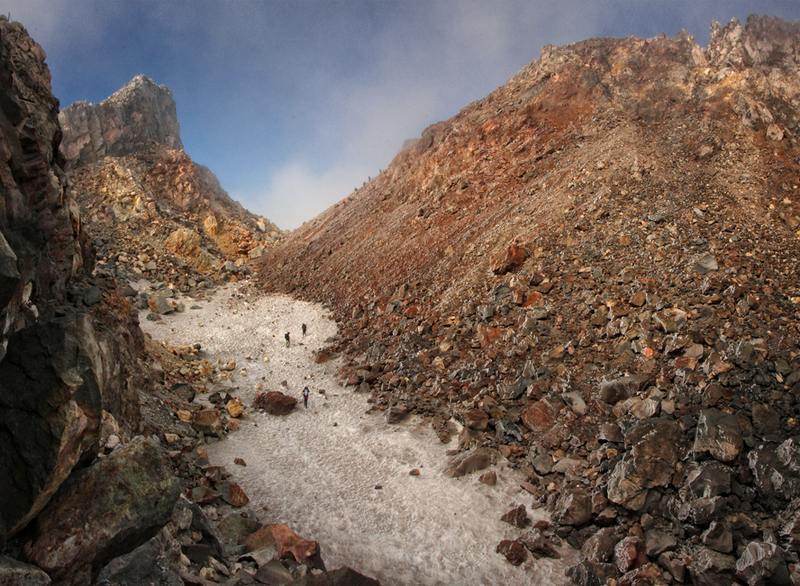 At Taranaki I experienced all of this together. Unbelievable what a strenuous effort the descent was. I would have almost prefered to walk upwards twice (that means a lot if you know me a bit). The wish for the “magic walking stick” shortly crossed my mind again. But well, instead I had to accept that I was landing on my backside every now and then just to keep sliding another 3 more metres or so. 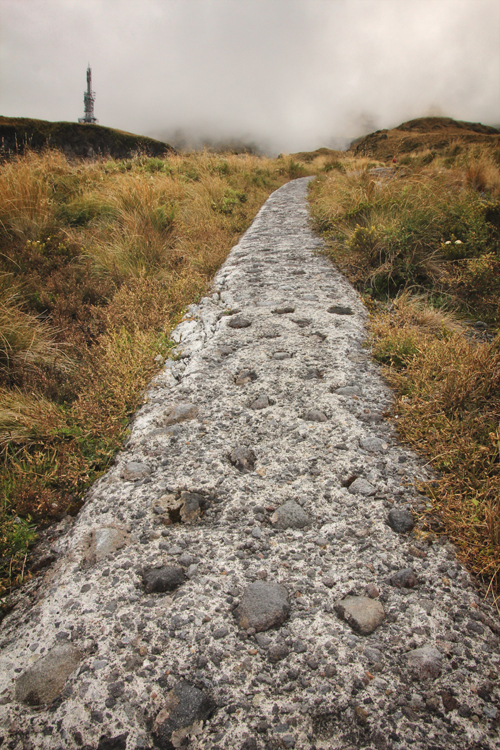 The steps at the end of the scoria slope appeared as a blessing. And the gravel path back to the parking lot almost didn’t count anymore as we were filled with pride and on cloud number 9. 13 km in 8 hours. According to Venture Taranaki a great job. Even the comment that there are crazy mountain runners completing the distance in 2 hours couldn’t ruin my great mood. 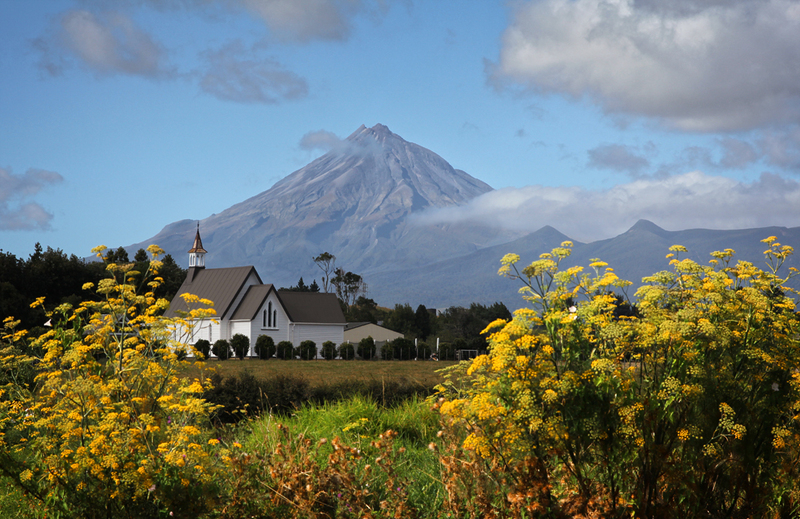 A final word about our preparations: We decided about a year ago to give Taranaki a Go. In addition to physical fitness the head played an important role because without motivation you won’t get far. 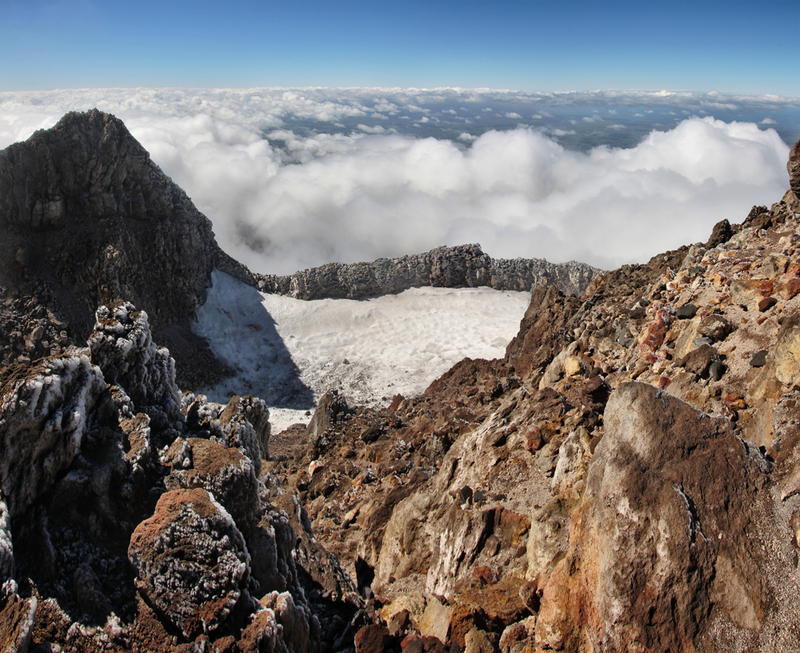 A very worthwhile blog post on the same climb (there are different paths to the summit) has been published on Windy Hilltops: Tramping in New Zealand (including interesting Taranaki facts). This was one of the field reports that made us believe we can reach our goal. Back in Auckland, we are proud as Punch and full of great memories of “The Naki”.